PORTLAND, ME – There’s a grapple skidder hauling a load along the edge of the tree line this morning, a slasher at work on the landing, and before long an empty pulp truck pulls up ready for a load of logs. If it weren’t for the low hum of rush hour traffic beyond the trees, you’d never know this logging job is in the middle of Maine’s largest urban area – a thinning operation in Portland’s Evergreen Cemetery woods that has been underway since mid February and has brought Master Logger company Kimball Logging & Firewood of Poland, Maine to work about as close to the geographic center of the city as you can get. 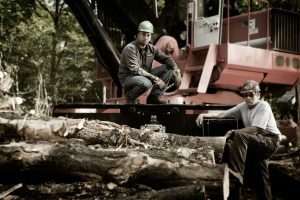 Ron Kimball and his son, Randy, are used to logging wherever jobs take them, but they admit this job is different. “When people saw us rolling in here with all the equipment on trailers a lot of heads turned,” Randy says. The Kimballs don’t lack for experience. Ron grew up on a dairy farm in Poland and started cutting wood when he was 17. He is 56 now. He bought his first cable skidder when he was 31, and Randy rode with him in the skidder from the time he was a toddler so logging was in his blood from an early age. In 1989 Ron stopped working for others and went out on his own, and in time Randy went to work with him. Now between the two of them they have a four-man crew with a feller buncher, grapple, slasher, chipper, two trucks, a track dozer and other equipment including Ron’s firewood processor as needed. The crew is efficient and serious about safety and the job, but they find time to give Ron a hard time when he starts talking about retiring to Florida as a cold wind rises and he has to mount the loader with the open seat – it has great air conditioning he says. Like most other Maine loggers, the Kimballs are dealing with a tough market for softwood pulp and low chip prices. Costs to operate keep rising, and the closure of paper mills has been rough, but Ron says in his 39 years in logging there have always been ups and down in the business, and he thinks it may take a while, but new markets for fiber will eventually open up. In the meantime, he and Randy agree buyers of wood need to keep their prices high enough to afford loggers a living if they want to preserve a professional workforce to supply timber in the future. Many logging companies have branched out into construction, road building and other areas to reduce their reliance on the ups and down of wood markets, but the Kimballs are strictly a logging company and plan to stay that way. “All we do is cut wood, and that’s enough.” Randy says. But the forestry professionals and landowners that the Kimball’s work with will tell you they offer a lot more than just a quality job.